Living in the Chinese food mecca that is San Gabriel tends to make you jaded to some things. 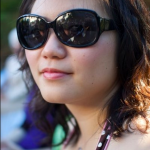 “Oh, another restaurant that has dumplings and xiao long bao? Been there, done that.” At least, that’s what I thought the first time I got wind of Hui Tou Xiang, a dumpling and noodle restaurant near my house. They must have opened next to Luscious Dumplings thinking they could grab up some of the people waiting in line for the dumplings at Luscious. For those people waiting out in the sun for a table at Luscious Dumpling: You’re missing out if you’re not eating at this restaurant next door. 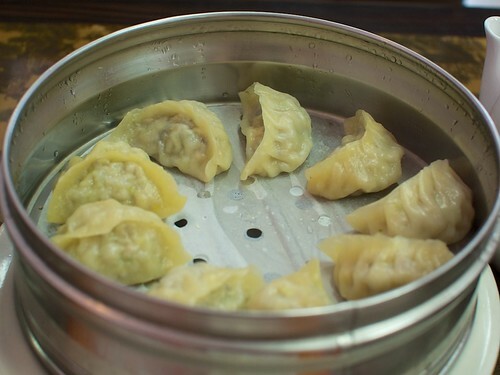 Hui Tou Xiang’s signature dish is the hui tou pan fried dumpling which looked like a rectangular gyoza with an almost bready skin. Unfortunately, I didn’t get it the first time I got there because I was lured away by the crab xiao long baos. The waiter assured me that they made them in house, so I ordered a steamer of these soupy dumplings. While waiting for the dumplings, the lao ban niang brought out a complementary dish of northern-style kimchi and sweet and sour soup. The sweet and sour soup was actually not bad — its tangy flavor went well with the warming back-of-the-throat spice of white pepper. The slivers of wood ear mushroom and egg drops lent some texture diversity to each slurp of soup. 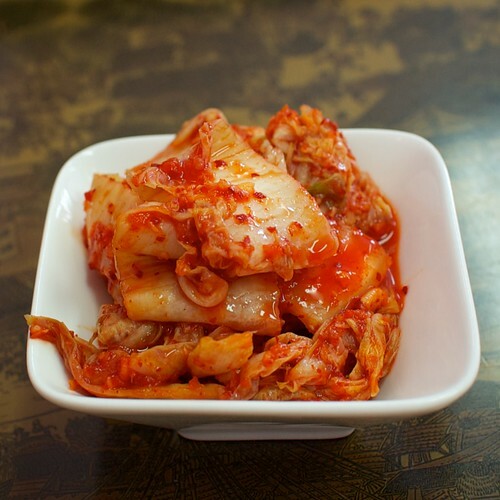 The spicy cabbage kimchi was surprisingly sweet, but still delicious and pungent. The xiao long bao arrived in all its steaming glory and I was glad to see none had broken open during transit. I poured vinegar into a boat full of slivered ginger and had my first bite. It was wonderful. The juice was hot and savory and just shy of “burn a hole in my mouth” hot. There was lots of crab meat inside as well as flavorful pork. The wrapper was the perfect thickness because it was substantial enough to hold the juice but thin enough not to overwhelm the flavor of the filling. It was probably the best xiao long bao I’d had in a long time. Luckily for will, there is a handful of vegetarian options on the menu. He ordered the tofu-skin appetizer, which was layers of tofu skin pressed together and then braised in a sweet-ish soy sauce liquid. It was refreshing, especially with a leaf or two of cilantro. Hui Tou Xiang also offers steamed vegetarian dumplings, which were pretty good. The wrapper was nice and chewy and while the filling was a bit under-salted, the rest of the flavor was good. What to do with leftover salted xue cai, bamboo, and five spice tofu? Make xian bing of course! 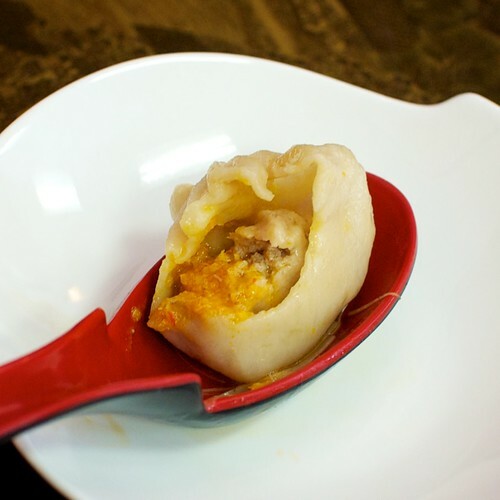 The most delicious xian bing, which means “stuffed pastry” in Mandarin, is the kind filled with ground meat and has lava-hot meat juice squirting out at every bite. While this may not be the most traditional xian bing filling, it hit the spot sufficiently. 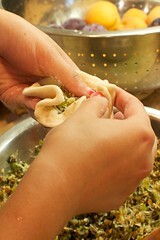 The filling was made with xue cai, bamboo, shiitake mushroom, five spice tofu, and glass noodles, all chopped up. This chopped up filling was then stir fried briefly with grated ginger and seasoned with salt, white pepper, and a little bit of soy sauce. The next time I make this, I’ll have to remember to add more salt and sesame oil at the end. The wrapper was made “free-style” with 2 cups all purpose flour, a few tablespoons of cooking oil, and a little less than a cup of warm water. 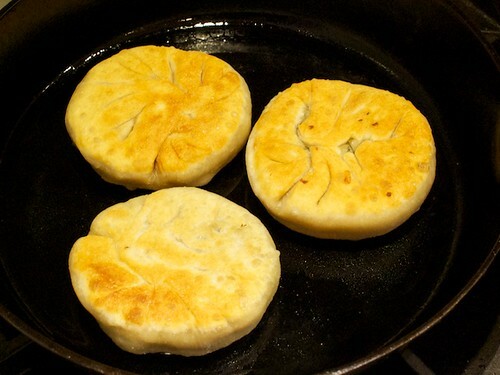 I added the oil in the flour and started adding water little by little as the dough formed. The end result should be a less-than-tacky dough. Cover with plastic-wrap and lest rest for half an hour. 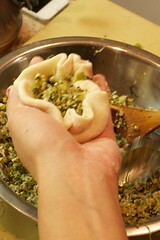 The hardest part seems to be actually filling the pastry. 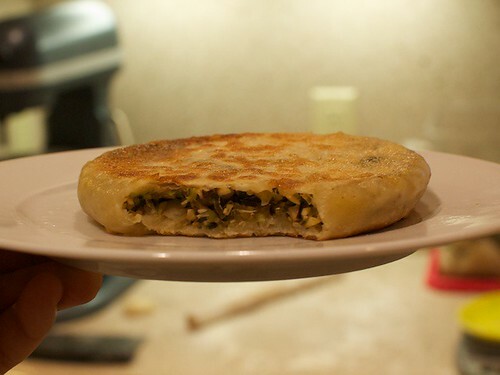 I rolled out small portions of the dough into circles and filled it with about 3 spoonfuls of filling, wrapping it like a bao, pinching as I went. In the end, I pinched the opening closed and placed it opening-side down to be fried in a bit. 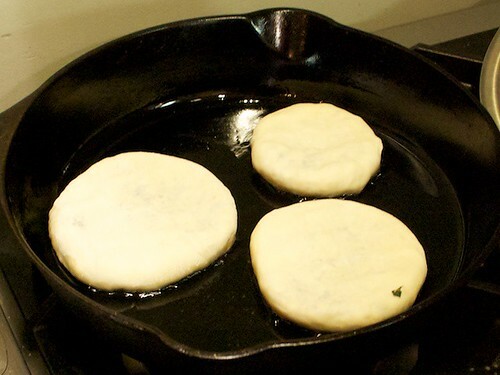 Pan frying one side golden. Flip, and pan fry the other side. The end result was pretty good eaten hot from the pan and dipped in black vinegar. 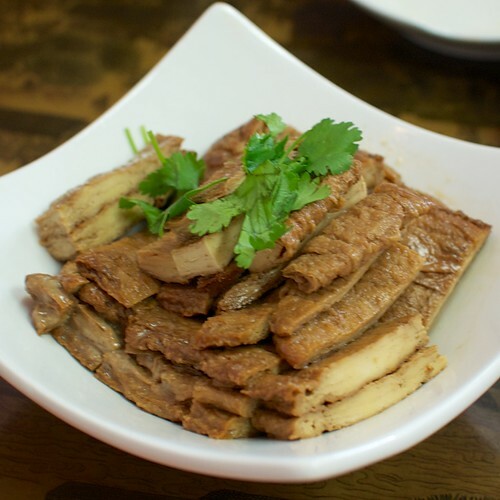 Lu ro fan or lo ba fan to you Taiwanese speakers is a simple comfort dish that can be found in many canteen-style food courts around China and Taiwan. 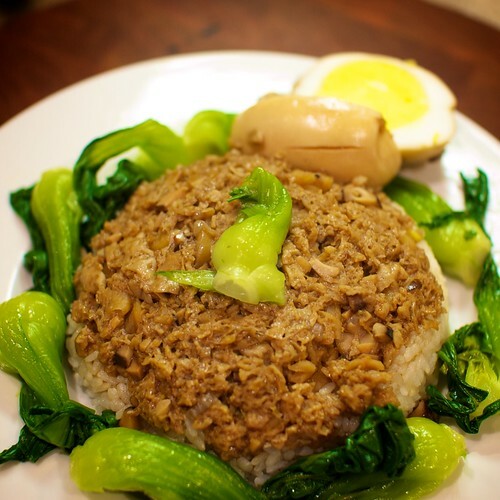 It’s stewed ground pork usually served with a side of preserved vegetables on rice, or for those who are slightly health-conscious, fresh vegetables like bok choy. It had been a while since I ate this since I never make it at home and I never order it when I’m at a restaurant that has it, but I was craving it and wanted to try making a vegetarian version. It turned out pretty easy to just substitute the pork for wheat gluten. I bought fresh wheat gluten, like the type you use to make the Shanghainese dish kou fu, chopped it up finely, and mixed it up with the rest of the ingredients: chopped shallots, garlic, shiitake mushroom, and pickled radish. I added the pickled radish to give it more flavor since wheat gluten isn’t as flavorful as real pork. It’s seasoned with a mixture of soy sauce, dark soy sauce, Chinese cooking wine, sugar, mushroom soaking liquid, and about 2 cups of water. I let that stew for about 30 minutes with a few hard boiled eggs while I boiled some bok choy. The entire thing was easy to make and assemble. Including the rice cooking time, it took less than 45 minutes to make enough for dinner and lunch the next day. Next time I make this, I’ll probably throw in some chopped wood ear mushroom to give it more texture and a little agar to add thickness to the sauce.